Dealing with the unexpected while traveling abroad is bad enough, but when things go wrong overseas it’s not only frustrating, it can be scary. Different culture, surroundings, language and currency all heighten the chaos in a bad situation. However, if you stay calm and treat these problems as just part of the experience, you’ll find they’re easier to manage. Certain issues, while inconvenient, don’t have to be entirely unexpected. For instance, if you forget your adapters or converters, you should be aware that duty-free shops in airports are a great place to stock up on these gadget-aids. If you don’t notice until you’ve reached your hotel? Ask the concierge! The hotel may have extras you can use, and otherwise, the concierge can direct you to the nearest hardware store. If you feel homesick, head straight for comfort food or retail therapy. Try an Egg McMuffin, a Starbucks latte, or pull out the iPad and watch a little American TV. Yet there are more disconcerting issues you might face. You might walk into a public toilet and find it’s a hole in the ground. While this is a reality you might more readily expect while outside of the first world, this can surprise you anywhere from England to China. Things to do about it: Check the bathroom sign (often it will tell you if it is a squat toilet) and carry a small pack of toilet paper or towelettes in your bag. In the event that your client takes you to what you thought was a nightclub, but turns out to be a gentleman’s club, you should remain respectful but true to yourself. In some countries, this type of entertainment is accepted as part of a normal business day. As a woman, it can be uncomfortable and embarrassing. You can grin and bear it, or bow out gracefully. There is not necessarily a right answer, but as a female business traveler you should be aware that you might face this dilemma. Never force yourself into a situation in which you feel uncomfortable. In another example of the expect-able unexpected, transportation strikes are not uncommon, especially in Europe. Generally, the public is given advance notice of strikes (a quick internet search can give you some information about strikes in your area – try GoneOnStrike, SummerInItaly - for strikes in Italy only, or FCm Travel Alerts) but there occasions when the public is caught off guard. If you learn of a planned airline strike, and are scheduled to fly on the day of the strike, call to see if you can get a flight change (free of financial penalty, of course). Public transportation strikes may require a lot of walking. Ask the concierge or local friends for tips and advice – they know the more about the transportation system, but they also know shortcuts. If you lose your passport, contact your country’s nearly embassy or consulate for help (here is the list of US embassies and consulates). If you are a United States citizen, you will need complete the lost-passport application you will get from the embassy or consulate. You will need proof of citizenship (this is where having a copy of you passport comes in handy! ), two passport photos (get replacements before going to the embassy), and proof of identity (driver’s license or birth certificate). There will also be a fee for a replacement. Getting a traffic ticket abroad is not much different from getting one at home, except you won't be able to contest it (check out this article on fishy traffic tickets). Stay aware of the customs and road laws. Of course, there will always be the truly uncontrollable. The best fix is to keep calm under pressure and stay hyper-prepared - true Woman Road Warrior words to live by. While it's hard enough to plan a trip to another town or state, going overseas presents a whole new set of challenges for a business traveler, including safety and security. But with careful planning, you can keep your worries to a minimum. Verifying that all travel documents are up to date. Leaving one copy of your itinerary, travel documents, and credit cards at home and another with you in a secure place. Carefully planning and packing your carry-on bag. Bring medicine, snacks and plenty of water! 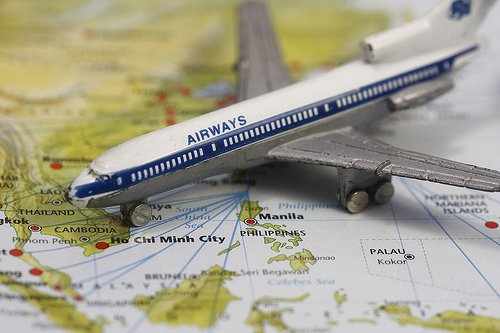 Alerting your credit card company to your international travel plans. If you find yourself in a jam while overseas, the best advice I can give is to stay calm and treat solving the problems as part of your experience. You'll realize you can deal with anything that comes your way. If you are creating a budget for your next business trip, be sure to include tipping! Travel is an industry made up largely of strictly service employees – many of whom rely on your tips. Tipping can lead to better service and easier days. Since the etiquette of tipping can be a little confusing, here’s the Woman Road Warrior guide to airport and hotel tipping that may help. If travelling abroad, be sure to learn about your destination’s customs and tipping idiosyncrasies (here’s one great guide ). Tipping at the airport is very simple: You need to do very little of it. In the case of most airline services, tipping is frowned upon. However, if you use curbside check-in it is customary to pay the skycap $1-$3 per bag, in addition to paying the standard $2 a bag charge. The base fee goes to the airline, not the person who checks your bag. If a skycap or baggage handler helps you carry your bags after the flight, out of baggage claim and to your transportation, a $2-$3 tip per bag is similarly customary. If, for any reason, you require wheelchair services or a ride on an electric cart, tipping may also be required ($3-$5 for a wheelchair attendant, $2-$3 for an electric cart driver). Of course, if you go to a full service restaurant or coffee shop, get a manicure or grab a drink, then you should tip in the same way you would if you were outside an airport. Hotels require a bit more tipping than airports. While you should not feel obligated to tip someone who provided less than adequate service, most hotel employees rely on tips for their living. Therefore, hotel employees expect tips, and you’ll generally both be better off if you give them. You should also take into account the city and nature of the hotel in determining the amount. You should tip a doorman $2-$3 if he hails a taxi for you or assists you with your luggage. Otherwise, no tip is expected. 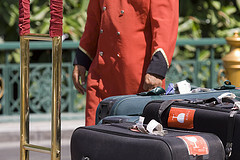 Bellhops should be tipped $2-$5, depending on (1) whether he brings the luggage to your room, (2) how many bags you have, (3) if he offers other services, such as bringing ice. If the bellman delivers a package, or housekeeping delivers an extra pillow, give one or two dollars tip for the delivery. If gratuity is not already added to room service, a 15 to 20 percent tip is customary, in addition to the $1-$2 dollars for the attendant who delivers the meal. You should tip your valet at least a dollar each time he brings out your car. And although they work out of sight, remember to tip your maid service $1-$3 per night. You can leave that in an envelope marked for housekeeping, or leave your change on the table. Leave it each day as housekeepers can change during your stay. Tipping for on-the-ground transportation is generally simple.There is no tipping involved in renting a car. If you are particularly happy with exemplary service, you may want to write to the company with your compliment. You shouldn't tip when you use public transportation either. It is customary to give your taxi or limo driver a tip of 15-20% of the fare. You should give shuttle drivers $1-$2 per piece of luggage, and a dollar or so to a valet who brings your car around when you leave. If you have been particularly impressed by someone’s service, you should write a note or contact the company's manager to praise that person. In addition to it being a nice gesture, you might be helpful to someone's career.